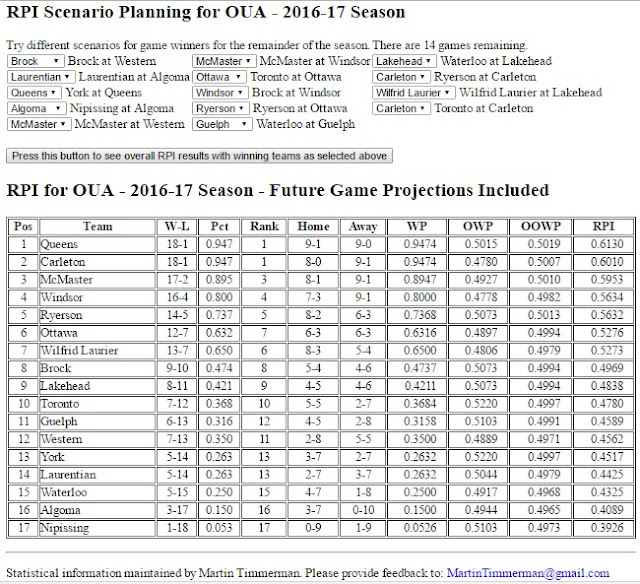 Last weekend's results, namely Carleton earning an eight-point victory on Queen's court, hastens re-extrapolating. Carleton has run the table in league play since that inexplicable road defeat against Algoma in November. Somehow, the one-loss teams in Ontario are respectively Nos. 4 and 5 in the coaches' poll while the Marauders remain No. 2, even though they were defeated soundly by one team and lost at home to the other. Is there strategic voting happening? Quite possibly. In Canada West, No. 9 Saskatchewan is top seed for the RPI-offs, with the 2-3-4 slots filled by Regina (ranked No. 3 nationally), Winnipeg (No. 7) and unranked Alberta. Based on the consensus of the cognoscenti, then, the conference's two best teams are on course to play for an auto-bid. Rather than be capricious and arbitary -- see, Stephen Miller is not the only one who can use bigly words to betray that he's easily threatened -- we'll go strictly by the poll for seeding this one. Laval (RSEQ champion). They have scored 90 points twice in conference play. Their male brethren have hit 80 once. Regina (Canada West champion). They have defeated Winnipeg on its floor, so the Cougars would seem eminently capable of doing so on a neutral floor. McMaster (OUA champion). If they are as good as the poll says they are, then the Marauders should be able to win out, upend Carleton in the play-in semifinal and then win the Critelli Cup to get the top spot out of Ontario. Queen's (OUA finalist). The first-in-RPI Gaels will have benefit of home-court advantage throughout the Critelli Cup playoffs. Carleton was full value for its 60-52 win last Friday, but the Ravens made 8-of-18 treys against the best three-point defending team in OUA and the Gaels were 2-of-10 from deep against the 14th-ranked three-point defending team. That 18-point gap was the game story. There is likely no chance of a rematch between Carleton and Queen's until the Critelli Cup or the Final 8. Queen's is in line to get either Ryerson and Windsor in the semifinal. Saskatchewan (Canada West finalist). Yes, there would be poetic (in)justice if the teams who were each first in RPI go head-to-head at nationals. If Alberta gets knocked out in the quarter-finals, then there's a potential Winnipeg-Saskatchewan play-in Canada West semifinal. Winnipeg has already defeated Saskatchewan twice. Saint Mary's (AUS champion). Remember they defeated Carleton and played close scores against the other members of the Ontario triad shortly after Christmas. Carleton (at large). Have a higher spot in the polls than Winnipeg and one fewer loss in conference play. The Wesmen are 5-1 against the other teams included in this exercise and the Ravens are 5-2. That also comes into play. Victoria (host). Their seeding ain't changing, barring a miracle run.